Everyone went crazy over Gold, but not Hawkeye! With the crisis in Cyprus unfolding, every pundit and novice commentator was calling gold to new highs. However, the Hawkeye system was in opposition, as the only true leading indicator — volume — did not confirm. The Hawkeye Volume indicator was built on Volume Spread Analysis, and is quite complex… but we made the display very simple and intuitive, using only three colors to identify the presence of buying, selling or neutral volume in the market. 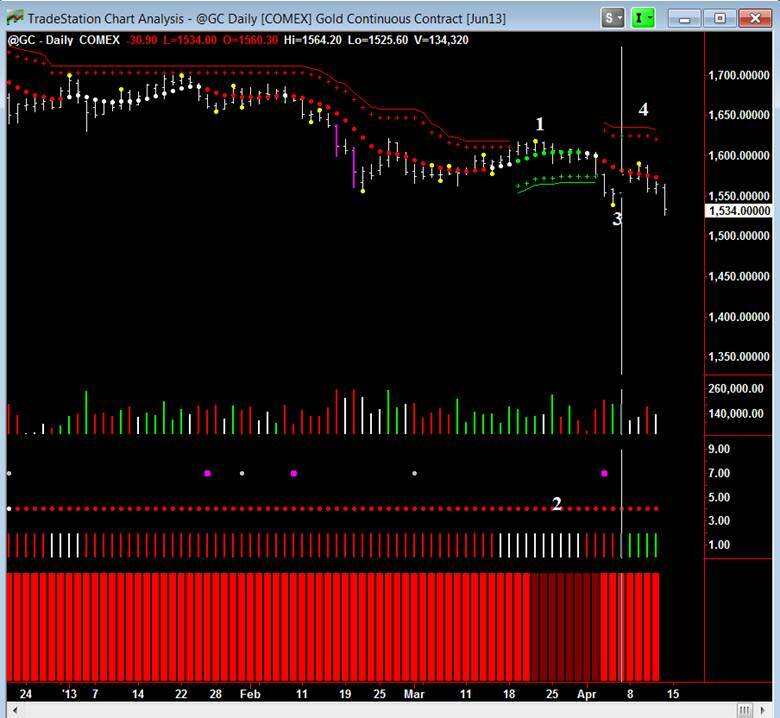 The power of Volume Spread Analysis is revealed in Gold. 2. notice there was no confirmation of either green buying volume or green trend from our unique Roadkill indicator, showing us what the weekly time frame was doing… neutral volume and red down trend. 3. A pivot low (yellow dot) with 2 bars of buying volume pushes market up 3 bars in an overall down trend. 4. LOW RISK ENTRY: a pivot yellow dot formed, and neutral volume followed by selling volume pushes market down, and it closed down $25.30 on the week. The weekly volume from the previous week was green, but the close was less than the open showing weak conviction. At the end of the week, April 12, 2013 was a widebar (twice average true range x 20 bars). The close was in the bottom 40% of the range. This confirmed the Hawkeye weekly trend that has been place since November 2, 2012. Remember the Hawkeye widebar rule: we now expect the market to consolidate hereuntil there is a weekly close lower than this widebar. This is the power of Volume Spread Analysis! Next PostNext Trade of the Week – Understanding Roadkill, a Low Risk Entry.